All students, faculty, and staff who wish to park a bicycle on campus must register it with the College. There is no fee for registering a bicycle. You will receive a free Gustavus Adolphus College Bicycle identification sticker that is to be placed on your bicycle. Note that bicycle racks at academic and administrative buildings are no parking 2am-6am during the winter months (mid-November through mid-March). No bicycle shall be used to carry more than one person at a time unless the bicycle is designed for it or has a child carrier. No person riding a bicycle shall carry any package, bundle, or other article which may prevent the operator from keeping at least one hand on the handle bars. Every bicycle being ridden from sunset to sunrise shall be equipped with a lamp on the front of the bicycle, and with a red reflector on the rear. While riding a bicycle on the roadway and sidewalk, pedestrians shall be given the right-of-way. Bicycle helmets are not required for riding on campus. However, for safety reasons, it is strongly recommended that every rider wear one. Bicycles shall not be ridden upon any ramp, stairwell, wall, bench, fountain, or other structures or facility or on over shrubbery or flower beds. Any person in violation of the rules and regulations listed above will be subject to a $15 fine. Parking and storage of bicycles is only permitted in the student's resident hall/room, employee office, or any of the bicycle racks placed at various outside locations on campus. Indoor bike parking is never allowed in corridors, stairwells, exit pathways, or outside on trees, metal poles, or anywhere where it may impede emergency exit or maintenance around or in a building. November through March, bike racks at Academic/Administrative buildings are no parking 2am-6am. Bicycles parked overnight outside of these areas will have their locks cut and will be subject to storage fees. Bicycles parked on campus must be locked in a bicycle rack with a chain and padlock or other locking device. 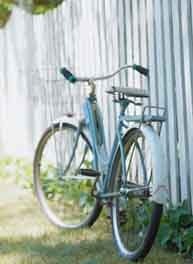 All non-registered or improperly parked bicycles will be confiscated by Campus Safety or Physical Plant personnel. If the bicycle is secured, the lock will be removed at owner expense. Campus Safety will hold registered bicycles at a charge of $5/day. Non-registered bicycles well be held at a charge of $10/day. Any bicycle confiscated or turned in to the Campus Safety Office will remain there for a period of thirty days. After this period, any bicycle not claimed by the owner will be disposed of. All students not staying at the College during the summer months must take their bicycle home with them at the end of the school year. Register your bicycle with the Department of Campus Safety. We also recommend that all bicycles be engraved in the event that a bike is stolen or lost; this aids in the return of the article to the rightful owner. This is a service provided by the Department of Campus Safety. Lock your bike with a U-lock at one of the bike racks on campus, even if you are only going to be gone for a few minutes. Do not lock your bike to lamp posts or to stairwell railings. Use the bike racks. Lock it or Lose it! Bicycle locks can be purchased from the Book Mark. Wear protective head gear, check all components of the bike for proper working order, invest in a headlamp and flashing rear light for night time riding, and obey all traffic control devices, and use proper hand signals. Not all drivers may be paying attention, so you must help as much as possible. If you believe your bike has been stolen or is lost, check all of the bike racks on campus. Then come to Department of Campus Safety to file a report.